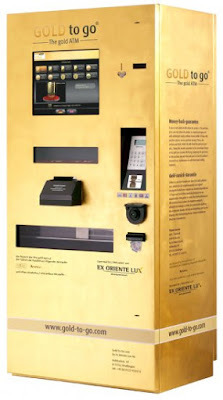 Golden Nugget is a fitting name for the first hotel in Las Vegas to install an ATM machine that dispenses gold instead of cash. The Gold to Go machine will dispense gold coins and bars ranging from 1-250 grams. Prices are adjusted on a minute by minute basis to reflect current market prices, and then marked up by about 5%. By my calculations one gram should currently run about $50. A gram isn't very big though (finger nail size) so you'll probably want to go with a full ounce, priced at about $1500. I think this is a pretty sweet concept. Las Vegas has some great money blowing options for those lucky enough to leave the casino ahead, but this one might actually give you a return on your investment. For more information check out Gold to Go.